Britain’s biggest payday lender was yesterday named and shamed by the City watchdog, the Financial Conduct Authority. The FCA ordered it to pay more than £2.6million in compensation to 45,000 customers who received the bogus letters. But consumer groups say there is clear evidence of a criminal deception and insist the police should be brought in. While the company presents itself as the ethical face of the payday loans industry with its friendly TV ad puppets, an investigation by the FCA found extensive evidence of ‘thuggish’ behaviour. 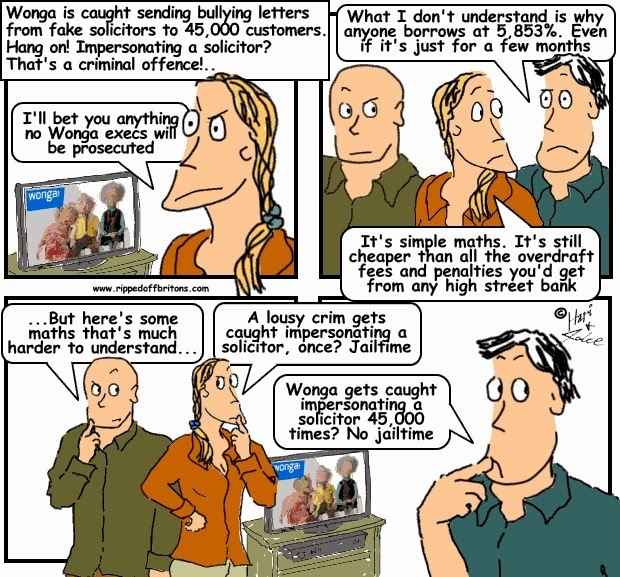 Among Wonga’s victims threatened by the fake legal team was a woman who missed repayments because she was in hospital recovering from a miscarriage. The FCA said Wonga sent letters to customers in arrears from what appeared to be two law firms, called ‘Chainey, D’Amato & Shannon’ and ‘Barker and Lowe Legal Recoveries’ – but these two companies were invented by Wonga to put pressure on customers. In some cases extra charges were added to the outstanding debt to cover the cost of sending these threatening letters. Despite the damning evidence, the watchdog added that £2.6million is the biggest compensation order it can impose on Wonga – because the wrongdoing occurred before tougher laws were implemented last year. The City of London Police have confirmed they will re-consider opening a criminal investigation into Wonga. Previously they had ruled it out, saying the case should be left to the regulator. But they said now the regulator's investigation had finished they would "be reassessing whether a criminal investigation is now appropriate." Wonga sent letters from non-existent law firms to customers in arrears between 2008 and 2010. Earlier on Friday, the Law Society, which represents solicitors in England and Wales, called for an investigation by the Met Police for "dishonest activity" in sending letters from fake lawyers.